You know how everything from gnats to dogs to people becomes more disgusting and/or terrifying in a swarm? Let’s hope that doesn’t hold true for robots. Although not gross en masse, the future will certainly show us just how scary a swarm of flying robots can be. And it may not be as far off as you think. 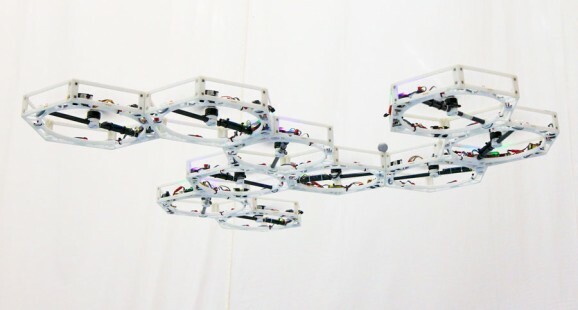 Researchers at the Swiss Federal Institute of Technology in Zurich have developed Distributed Flight Array, a modular, multi-rotor, robotic vehicle that can drive and fly, as well as adjust its behavior for increased reliability and performance. 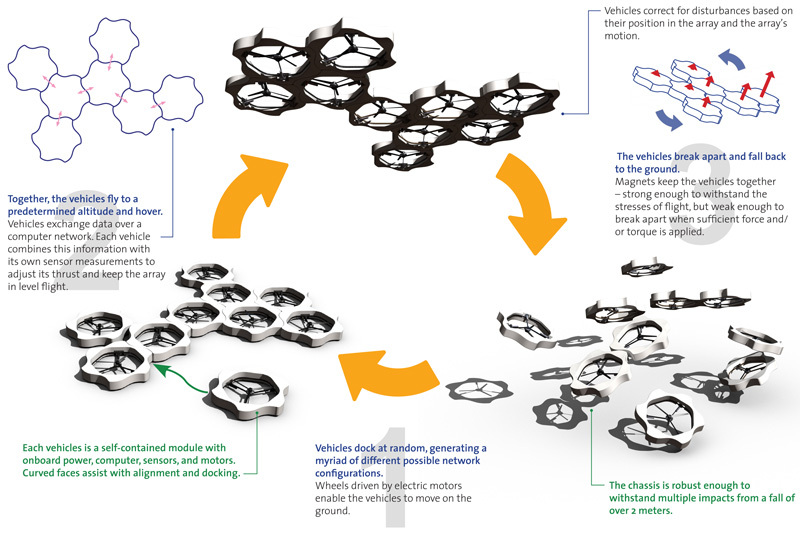 Amazingly, the hexagonal robot does this by autonomously assembling itself, putting together the right amount of individual bots and rotors to fly effectively. Much like a kid’s interlocking toy, the individual robots join together into an autonomous whole that is more than the sum of its parts. It’s a little like Voltron, at least a first step in that direction. The way these robots work together reminds me of a society that has decided that what’s good for the collective trumps what’s good for the individual. They each operate according to the same system of rules. First, they assemble on the ground, using their omni-directional wheels to get them to a dynamically-generated meeting spot. The units then communicate via infrared light and latch together, thus allowing for coordinated mobility. The units in the video below are a slightly older version, using magnets and pushpins rather than the newer infrared light system. One of the most impressive aspects of these robots is their ability to “sense” or measure inertia, distance, and altitude. The shape of the assembled drone, as well as the placement of each rotor, affects how it will fly. When the finished unit takes off, half the rotors turn clockwise, while the other half turn counter-clockwise to reduce torque and promote stability. Scientists conducted a number of indoor flight experiments to see how the unit responded to disturbances, yaw, and other feedback. A coordinated flying system has a number of potential applications, particularly when it comes to the military. A single drone could be comprised of parts with various functions, equipment, and power supplies, as well as the ability to adjust its mobility on the ground or in the air. You can custom make a robot to fit the needs of a specific situation. While this isn’t the first example of swarm-bots, they are the first to assemble on the ground and then take to the air, all the while operating autonomously. The swarm-bots in the video below also self-assemble and then engage in cooperative transport, though they’re much slower than the DFA, and they can’t fly. Where’s the fun in that? They may be small, but they’re deceptively strong, as is on full display in this next video. Clearly, restaurants, supermarkets, and airplanes should stockpile these things, although I suppose it’s a good thing that this model of swarm-bots can’t fly, or we’d all be in trouble.